It has been the sort of day which encapsulates the best and worst of our democracy. The best in that the most important issue of all – the matter of war and peace – was openly discussed in great depth and at great length. The worst in that those who made mistakes in the heat of the moment were too proud to apologise for it. Last night, the Prime Minister let his legendary temper get the better of him and said to those Tory backbenchers who were going to vote against military action in Syria that they would be voting with (amongst others) “terrorist sympathisers”. It was insulting and unstatesmanlike, and at the start of today’s epic debate he attempted to play down the scandal, but like a child who was being told to say sorry for something he didn’t feel sorry about, David Cameron did not apologise. Then 10 hours of debate followed. Numerous speeches were excellent. Both for and against. Yvette Cooper, Margaret Beckett, Andrew Tyrie, Sir Alan Duncan, Angus Roberston all excelled themselves, to name but a few. Hell, even Tim Farron rose to the occasion. In contrast, David Cameron was hampered by his outburst the previous evening, and Jeremy Corbyn was halting and lacking in coherence. However, like many a Shakespearean drama, the best moment came from the subplot, which has been about the Labour party and the divisions within it. It was encapsulated when Hilary Benn stood up to speak against his leader’s position. Benn’s famous father Tony may not have delivered the speech that his son did tonight, but he was somehow, seminally present. His son stood up for what he believed. He spoke with passion and verve and if you closed your eyes just a bit you could have seen his progenitor in the mannerisms and gesticulations that he used. When talking of the “fascists” of Daesh who hold everyone else in contempt, he produced a grand sweep of his arm as he pointed to every member of the House. It was a Bennite expression, and will live long in the memory. Hilary Benn’s speech was about the matter at hand and he made a clear case. But the speech was also about the soul of the Labour party. 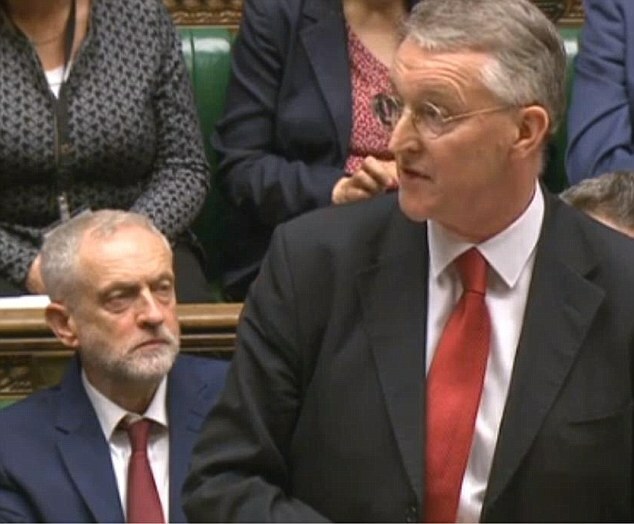 His leader sat grim-faced behind him, and he got grimmer and grimmer as Benn’s rhetoric soared and drew purrs of approval from the opposition benches behind. It spoke of Labour’s role in founding the UN, in being a party of internationalism. It was not just opposed to his leader’s view on Syria, but to his leader’s foreign policy almost entirely. As Daniel Finkelstein noted this morning, after the 1970 election defeat his father asked Harold Wilson whether he still had to speak with the opinion of the Shadow Cabinet. Today, his son took on that spirit but the irony of all ironies is this: Hilary Benn tried to reclaim the soul of the Labour party from a Bennite. His speech was greeted with applause (unparliamentary, but allowed by the fastidious Speaker Bercow), and cries of “outstanding”. His opposite number, Philip Hammond, called it one of the great speeches. When he sat down next to Jeremy Corbyn the tension was palpable. John McDonnell looked crestfallen. The speech of the day had been given in opposition to their position and by their own Foreign Secretary. Whether you agree with his conclusions or not, to see someone to speak with such passion and energy and conviction and good conscience and import in such extraordinary circumstances is the true celebration of what our Mother of all Parliaments gives a platform for. The votes began and a hush descended before the result was announced. The motion was carried by 397 to 223: a majority of 174. The word was that 15 Labour waverers were swayed by Benn. A severe moment, and it is worth echoing the words of Toby Perkins (Labour, Chesterfield) from the debate: “I envy those who describe this choice as a “no brainer”… It’s not been obvious to me, it’s been very, very difficult indeed.” He voted against military action.